Constantinople (Gr. 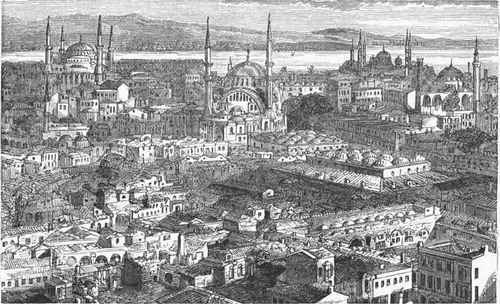 the city of Oonstantine; Turkish, Istambul or Stam-bul), the capital of Turkey, situated at the S.
W. entrance of the Bosporus, upon a triangular peninsula belonging to the European (Thra-cian) shore, and formed by the Golden Horn (the harbor of Constantinople), an inlet of the sea, and the sea of Marmora, in lat. 41° N., and Ion. 29° E. Its population, including all its suburbs, was in 1848, according to the official tables of the board of health of that year, estimated at 778,000; the present population is by some estimated at 1,000,000, and by others, who are probably nearer the truth, at not more than 400,000 or 500,000. Of the inhabitants more than one half are Mussulmans, and the remainder are Greeks, Armenians, Jews, Persians, and other orientals, and many Levantines or native Christians of European descent. The location of Constantinople is equally favorable in a commercial and in a political point of view. Its harbor, which is capable of containing 1,200 ships, is thronged by vessels of all nations, and its commanding position at the junction of the Mediterranean and Black seas would, in the opinion of many, render it, if in the possession of a strong and energetic power, the key of the political supremacy in Europe and Asia. - The picturesque aspect of the city is celebrated; but the favorable impression made by the beautiful liilly shores, beset with villas and gardens, vanishes at the first glimpse of the interior of the city. The streets, before the great fires of 1865, '66, and '70, were nearly all narrow, crooked, and exceedingly dirty, the houses dilapidated, and the atmosphere filled with offensive odors. The old city proper is about 12 m. in circumference, and is enclosed on the land side by a triple wall and moat, which, although unimportant as defensive works according to the requirements of modern military science, might in an emergency offer considerable resistance to an enemy. The wall has 27 gates. The old streets, the irregularity of which defies all attempts of the stranger to find his way, have generally no names, nor arc the houses numbered; they are badly paved, not lighted at night, and in addition to their general cheer-lessness they are the resort of thousands of ownerless dogs. The houses here are for the most part built of wood, and hence destructive conflagrations are of frequent occurrence. During one night in 1852, seven fires destroyed an aggregate of 8,500 houses. A still more destructive conflagration took place in September, 1865, which is said to have swept away 8,000 houses, 20 mosques, and a large number of baths, khans, and public buildings. Another severe fire occurred in May, 1866; and still others in June, 1870, and early in 1873. The city is divided into separate districts inhabited by Turks, Greeks, Armenians, and Jews. The Turkish districts are the most extensive. The bewildering labyrinth of streets, lanes, and alleys is almost unrelieved by public squares, of which only the following are worthy of mention: At Meidan (horse square), a portion of the old hippodrome; Serai Meidan (palace square); Serasker Meidan, a portion of the old Forum Tauri; Tavuk Bazaar (poultry market); Jindi Meidan; Et Meidan, where the public executions take place; and Vefa Meidan. 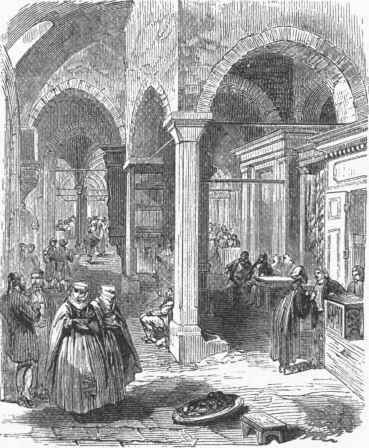 A feature peculiar to Constantinople is the bazaars or market halls, large fire-proof buildings lighted from above, in which hundreds of tradesmen and shopkeepers retail their wares, and some of which enclose several covered streets. Open markets for the sale of horses and cattle, fish, etc, are kept daily in several streets or squares; also a market for old clothes, not inappropriately called the Bit Bazaar, or lice market. The Avret Bazaar (women's market) was formerly set apart for the sale of female slaves. Of castles there remains only one, the castle of the seven towers (Yedi Kule), originally built as a citadel, but afterward used as a state prison for princes, and the ambassadors of nations at war with Turkey. The sultan's residence of state is the Serai Humayun (seraglio), a small walled city of itself, nearly 2 m. in circumference, and including mosques, dwelling houses, baths, gardens, governmental offices, the mint, arsenal, and treasury building. Formerly it was inhabited by at least 6,000 persons, and entirely inaccessible to strangers. The mystery which surrounded it gave rise to the most fabulous accounts of the splendor and magnificence of this imperial resi-dence all of which have vanished since it has been thrown open to visitors, who could not fail to see that the sultan's palace stands far below the residences of other European mon-archs in sumptuousness and commodiousness. The outer gate of the seraglio is called the Sublime Porte, a designation frequently applied to the Turkish government. The old seraglio (Eski Serai), erected by Mohammed II. in the centre of the city, is about 3/4 m. in circumference, and encloses the office of the secretary of war, two barracks, the military academy, etc. 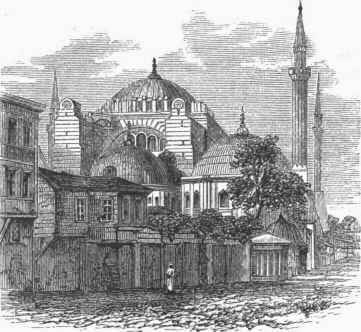 The number of prayer houses or mosques in Constantinople is very large. There are about 500 larger ones (jamihs), 100 of them in the old city proper, and the number of lesser ones (mesjids) is given at 5,000; but this is probably an exaggeration. Unrivalled in gorgeousness is the great Agia Sofia, formerly the church of St. Sophia, originally founded by Constantine in 325, rebuilt by Justinian in 532-'8, transformed into a mosque by Mohammed II. in 1453, and renovated by the architect Fossati in 1847. The edifice is built of light bricks, but throughout lined with colored marble; its ground plan has the form of a cross, 350 ft. long and 236 wide; the diameter of the dome measures 107 ft.; the height from the ground to the cupola is 180 ft. 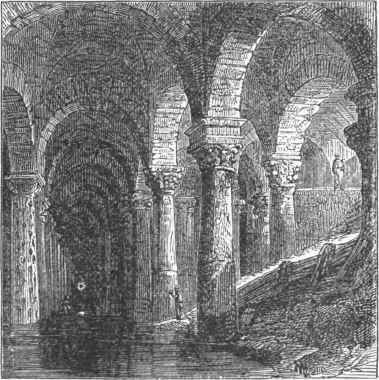 The ceiling and the arches between the columns are inlaid with beautiful mosaic work and gilt; the gallery, 50 ft. broad, is sustained by 67 columns, some of which are of green jasper, and are said to have been taken from the celebrated temple of Diana at Ephe-sus; nine massive bronze portals are covered with the most artistic alto-rilievo work. Other remarkable mosques are Kutchuk (Little) Agia Sofia, built by Justinian; Kilisse Jamih (mosque of the churches), the burial place of several Byzantine emperors; Exi Marmara Jamih (mosque of the six marble columns), said to have been a temple of Jupiter; the mosque of Mohammed II., with which are connected eight medresses (colleges), a hospital, an eating house for the poor, etc. ; the mosque of Sultan Ahmed, the only one that has six minarets; the Sulimaniye, built by Solyman the Magnificent in 1550; the Shah Sadeh Jamih (mosque of the princes), and the mosque Nuri Osmani, in the vestibule of which stands a sarcophagus of porphyry, said to have enclosed the mortal remains of Constantine the Great. Constantinople is the seat of the patriarchs of the Greek and Armenian churches. The Greeks have 21 churches in the old city; the prayer houses of the other denominations are small and unimposing. The number of Mohammedan and Greek convents is considerable. No one of the numerous religious orders of the Mohammedans is without one or more convents. Among the charitable institutions is a large number of imarets or soup houses, in which tens of thousands of persons are fed. There are 200 hospitals, in some of which Christians are provided for, over 2,000 public baths, and 40 khans (large enclosures, including warehouses and hotels). Two aqueducts 9 or 10 m. long, built by the emperors Hadrian and Constantine, furnish the city with water. The cisterna basilica, constructed under Justinian, the roof of which rests upon 336 marble columns, is still used as a reservoir. - The number of primary schools in Constantinople, in which only reading and the prayers are taught, is over 1,000; the former secondary schools have been abolished, and replaced by adult schools for instruction in Arabic, rhetoric, mathematics, and history. Most of the mosques have their medresses. There are also several special preparatory schools for civil service, as the college of "the sultan's mother," inaugurated in 1850, and others. Popular education is still at a very low point, despite the reforms that have been introduced by recent sultans. The military academies are as yet the only educational establishments in which a systematic course of studies, according to the modern standard of science, is pursued. Besides these, there are a medical and a veterinary college, and a naval academy. There is a number of public libraries, mostly connected with mosques, and some of them supposed to contain valuable old manuscripts. - Among the suburbs of Constantinople only five are frequently mentioned, viz. : Pera, Galata, Tophana, Kasim Pasha, and Scutari, all but the last named on or near the European shores opposite Stambul, between the Golden Horn and the Bosporus. 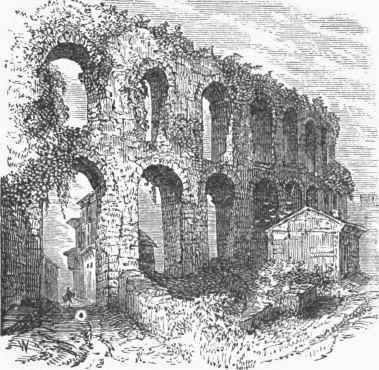 Ruins of the Aqueduct of Valens. Pera was until the fire of 1870 the principal seat of the Christian higher classes and of the foreign ministers, and contained churches for the principal Christian denominations, several theatres and concert rooms, four hospitals (English, French, Italian, and German), three post offices (Austrian, French, and Greek), French, German, Greek, and Armenian schools, and a new French college. Gas was introduced in 1858, and telegraphic communication with London completed in the same year. Ga-lata, built by the Genoese, is still enclosed by the old Genoese wall and moat, about 8,000 ft. in circumference. In the centre of the town stands an old round tower, originally intended as a work of defence, but now only used as a watch tower. It is 140 ft. in height, and from its top the finest view of Constantinople and its vicinity can be obtained. Galata is the principal commercial suburb of Constantinople. It is incessantly thronged by a busy crowd of merchants, clerks, carriers, seamen, etc. A merchants' exchange, the customs office, and an Austrian and an English marine hospital are among the prominent buildings. Tophana derives its importance from the large government founderies, the cannon made at which are equal to the best of European manufacture. The red and gilt Turkish clay pipes are also manufactured there on an extensive scale. Ivasim Pasha contains the great arsenal and navy yard. Scutari is situated on the opposite Asiatic coast, on the site of the ancient Chry-sopolis. An immense number of haiks (small boats) keep up the communication between it and Constantinople. A large business in silk and cotton goods, leather, etc, is carried on there. It contains a great number of khans and warehouses, also a Turkish post office, an imperial palace, and the barracks of the imperial guards. 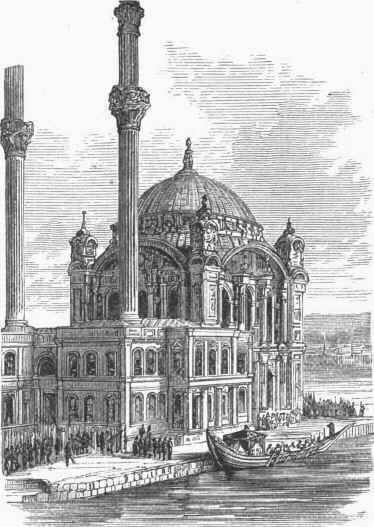 - Constantinople had greatly improved after the conflagrations of 1885 and 1866, when the greater part of Pera was again destroyed by fire, June 5, 1870. A new quarter has since sprung up near the tower of Galata, and the arsenal, which is rapidly filling up with fine buildings, bids fair to eclipse the former advantages of Pera. In place of the old wooden bridge between Stambul and Pera, there is now a new iron floating bridge; while the irksome communication between Pera and Galata, through crooked and steep streets, which made driving impossible and even riding difficult, has been superseded by a pneumatic tunnelled railway; and the great inconvenience to commerce from the absence of good landing places is to be remedied by the establishment of quays on both sides of the harbor. Horse cars run in different parts of the city and the suburbs. The railway to Adrianople was opened in March, 1873, and other railways are in course of construction. The oriental characteristics of the city are, however, not essentially altered by these innovations. Camels, hamals (porters), ara-bas (clumsy Turkish carriages), dervishes, turbaned orientals of all descriptions, and veiled women still throng the streets as of old; the bazaars are still picturesque and bustling. The number of foreigners is however increasing, especially the English and Germans. Since the great fire of Pera the neighboring villages have gained in population, especially Therapia and Buyukdere. - Constantinople is the seat of important banking and commercial establishments, and is the great centre of Levantine commerce. In 1870 the number of arrivals was 24,055 sailing vessels, with a tonnage of 5,042,009, and 1,322 steamers, tonnage 1,322,-926; the total arrivals in 1871 were 25,686 vessels, tonnage 5,483,818. The local industry, however, is unimportant. The principal articles of manufacture are leather ware, carpets, embroideries in gold, silver, and wool, arms, perfumes, and smoking apparatus of all kinds. In 1873 there were published in Constantinople 19 newspapers issued daily; of these 5 were in Turkish, 5 in Armenian, 4 in French, 3 in Greek, and 2 in English. Besides these there were 34 periodicals in different languages issued tri-weekly, weekly, and at longer intervals. - We have already described the origin and the history of this city down to A. D. 330, when Byzantium became Constantinople. (See Byzantium.) Afterward it was the capital of the Roman, or from 395 the Byzantine empire, and of the ephemeral Latin empire (1204-'61). In A. D. 413 an earthquake destroyed it, when it was rebuilt by Theodosius II. 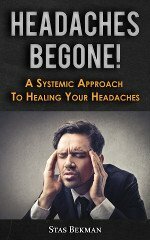 Its size and population under the Byzantine emperors may be judged from the fact that once, in the 8th century, 300,000 of its inhabitants fell victims to a pestilence. In the middle ages Constantinople stood a large number of sieges or assaults by Saracens, Bulgarians, Russians, Turks, and others. (See Byzantine Empire.) On May 29, 1453, it was stormed by the Turks, the last Byzantine emperor, Constantine XIII., losing his life in the defence, and since that time it has remained in their possession undisturbed.